Kirksey designed the new fitness center at Williams Tower. 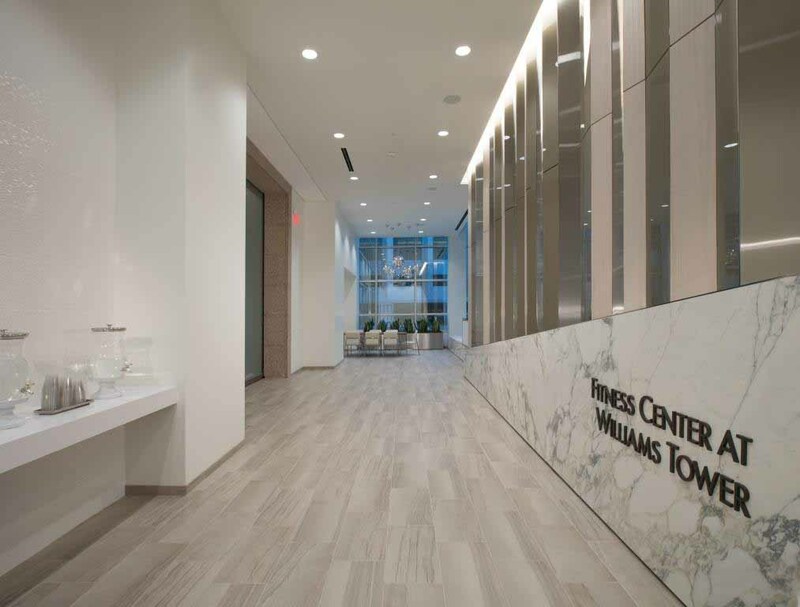 HOUSTON – Hines, the international real estate firm, and Invesco Real Estate, a global real estate investment manager, have announced the completion of a new fitness center at Williams Tower, the 64-story office building owned by Invesco Real Estate in Uptown Houston. The Fitness Center at Williams Tower, a members-only fitness facility serving the tenants of Williams Tower offers private and group personal training sessions, group exercise classes, on-site certified personal trainers and an on-site licensed massage therapist. The fitness and wellness program is Invesco Real Estate and Hines’ first offering of a broader amenity program being launched at Williams Tower to meet the evolving needs of today’s tenants. “We aim to provide space and amenities which allow businesses to thrive and be highly efficient. We believe that tenants at Williams Tower will find this amenity extremely useful,” said Williams Tower Property Manager Shannon Davenport. The Hines property management and engineering team managed the project, which was designed by Kirksey. Trophy Fitness, which now manages the fitness center provided design consulting and equipment procurement. Harvey Construction served as the general contractor. Williams Tower is a 1.5 million-square-foot, 64-story office building that was developed by Hines in 1982 and has been managed by Hines since. The building, formerly known as Transco Tower, has been known as the tallest tower outside a city’s Central Business District. At 901 feet in height, the building is considered the thirty-second tallest building in the nation and at one time was the tallest building west of the Mississippi River. Designed by Philip Johnson/John Burgee, the tower’s familiar silhouette on the Houston sky recalls the art deco style. Clad in silver gray reflective glass and anodized aluminum, the sleek tower is accented by columns of bay windows of non-reflective glass and podium setbacks on two lower floors and four higher levels. Williams Tower is leased to a number of world-class companies, including: Williams, Hines, Rowan Companies, Quanta Services, CBRE and Ryan LLC, among others. Williams Tower, located at the intersection of West Alabama and Post Oak Boulevard, is connected to the Galleria shopping center building by skybridge. The tower is adjacent to the Hines Waterwall park. In 2008, Hines REIT assumed ownership of the property. In 2013, the building was sold to Invesco. Invesco is one of the largest investment management firms in the world with $858.3 billion in assets under management. Hines, founded in Houston in 1957 by Gerald D. Hines, is a privately owned global real estate investment firm with a presence in 201 cities in 21 countries.